Following the series of killings unleashed by Fulani's herdsmen in the early hours of Friday, The attention of the Plateau State Government has been drawn to an attack along Rukuba Road in the early hours of Friday morning. The unfortunate action is said to be generating tension in Jos the state capital. 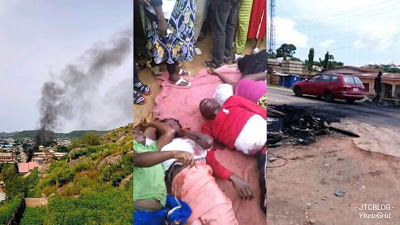 Plateau state commissioner of Information and communication Yakubu Dati in a press release in Jos express Governor Lalong's condolences to the families of the bereaved and entire community where the incident took place. Lalong said security agencies have been mobilized and are on red alert to track down the perpetrators. He assures that security agencies are on top of the situation and advice citizens to go about their lawful businesses without any fear of molestation or intimidation. The statement by the information commissioner advises citizens to shun fake news,rumour mongering & provide relevant information to security agencies to ensure a secured and peaceful state.